If you have lived near the coast or have visited for many years, you have probably noticed the changes in water levels in our marshes. Lots of people have told me that it used to be a really big deal when the meadows were flooded because it didn’t happen very often. Times have changed. Now, the meadows flood several times every month – even on sunny calm days. What causes this and what does it mean for our marshes and the wildlife that depend on them? Regardless of the cause, sea level in our area is rising. For the past 100 years or so, this is something that scientists directly measure through local tide gauges. We are fortunate to have several gauges in the area that have relatively long records so that we can see how sea level has changed. Sea level measurements taken in both Atlantic City and Cape May show that sea level is rising at a rate of about 4 mm/year (0.16”/year). This doesn’t seem like much perhaps, but between 1911 and 2016 that is a change of more than 1.3’ with more than 6” of that rise occurring after 1980. Simply put, the water is rising higher each year and we see it now more dramatically because it’s flooding the marshes more frequently to deeper depths. It’s also bringing high tide lines higher up on our beaches and now even causing flooding on some of the area streets. 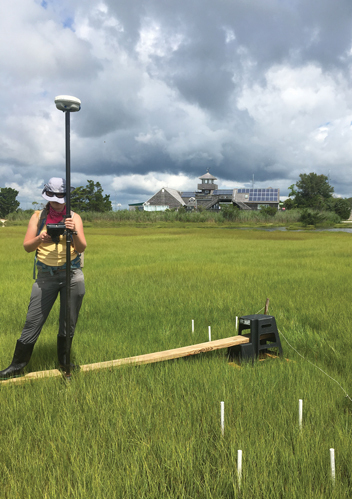 Understanding how local area marshes are adjusting to rising sea levels has been the focus of a new research program at The Wetlands Institute. 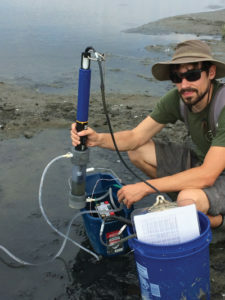 Thanks to funding from The Davenport Family Foundation and the Leff Family Foundation, The Wetlands Institute has launched a new Coastal Sustainability and Wetland Health Research Program. The research program is focused on studying how rising sea level is affecting our local marshes and the wildlife that depend on them. Over the past year, we have established several marsh monitoring stations that allow for precision measurement of the marsh surface elevation. Wetland plants are very sensitive to water depth and maintain maximum growth potential over a very narrow range of water depths. Thus, these stations enable researchers to understand how the marsh is responding to increased flooding. Coupled with monitoring marsh elevation, scientists are also documenting water chemistry and how well the marsh grasses are growing. Detailed surveys of salt-marsh dependent animals are also adding to our understanding about the impacts to local populations and builds upon decades of Institute work. The health of coastal bird and diamondback terrapin populations are tightly linked to the condition of coastal marsh systems. Changes in population size, marsh use, and breeding success can indicate changes within the salt marsh. Several species of birds nest just above the marsh surface and nest loss due to flooding has become a new reality for them. Birds of special interest include American oystercatchers, clapper rail, willet, and laughing gulls. There is a lot to learn so as stewards of the wetlands, our staff is working to learn as much as we can and provide guidance to decision-makers about the condition of our marshes and how they can continue to play an important role in coastal sustainability and storm protections for our community.